The hiss of air escaping from a leaky car tire is no one's favorite sound. Even less pleasant? Hearing that hiss of escaping air 250 miles above Earth's surface while inside the pressurized confines of the International Space Station. According to Eric Madaras, an aerospace technologist at NASA's Langley Research Center in Hampton, Va., if an air leak were to occur aboard the station, alarms would sound, and the astronauts would locate and correct the problem according to procedures. But with only the crew's eyes and ears to go on, pinpointing the source of a leak could be tricky. Madaras is trying to fix that problem. 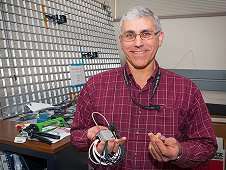 As the principal investigator for the Ultrasonic Background Noise Test (UBNT) he's leading a study that potentially could help prevent a catastrophic loss of air pressure on a crewed spacecraft. 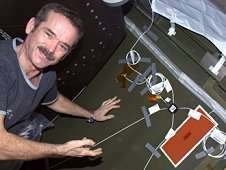 By observing the high-frequency noise levels generated by hardware and equipment operating in the Destiny laboratory and Tranquility module aboard the space station, Madaras and his team are helping to develop an automated system that would locate air leaks in a space structure's pressure wall - the outside part of the orbiting laboratory that keeps in oxygen. But dealing with a leak means identifying the source. Right now, that would require someone to listen for the signature hiss of escaping air - not an easy or quick task, especially on a noisy space station that has structures covering the wall where the leak might originate. "That's where the rubber meets the road," Madaras said. "[The transducer] would essentially be stuck on the surface and anything that moves the surface up or down would be picked up." Fourteen DIDS units will be installed aboard the space station: seven in Destiny and seven in Tranquility. "One way to look at that is to think about a cocktail party," Madaras said. "It's sometimes very hard to hear people, even near you, because of all the background noises. That's the same phenomenon that this has got to deal with. How do you get that cleaned up so that you can hear specifically the type of noise - the signal - that you're looking for?" The ability to locate pressure leaks in this way may have applications on Earth. According to Madaras, systems like the one he's working on could be useful when dealing with large pressure vessels containing critical material, like radioactive water at a nuclear plant. Right now, though, the focus of the research is on providing the crew aboard the space station with a useful tool, one that may give an astronaut just enough advanced warning to patch a leak and save a module from being permanently closed off. "The idea of giving them more time, trying to help them out and get that part done so they can get to the leak, and now they have the tools to fix the leak," Madaras said. "That, to me, would be a good deal." What happened to the old SciFi trick of letting a handful of balloons float around the cabin?